San Francisco may not have a single iconic sandwich like some other cities in America, but that means the creativity on display between two slices of bread is endless. Here, 8 spots in the Bay Area embracing the infinite possibilities of the sandwich. Get ready to get hungry. Imagine a favorite food of your youth elevated to great new heights, and you’ve got Mission Cheese’s very popular California Gold sandwich. 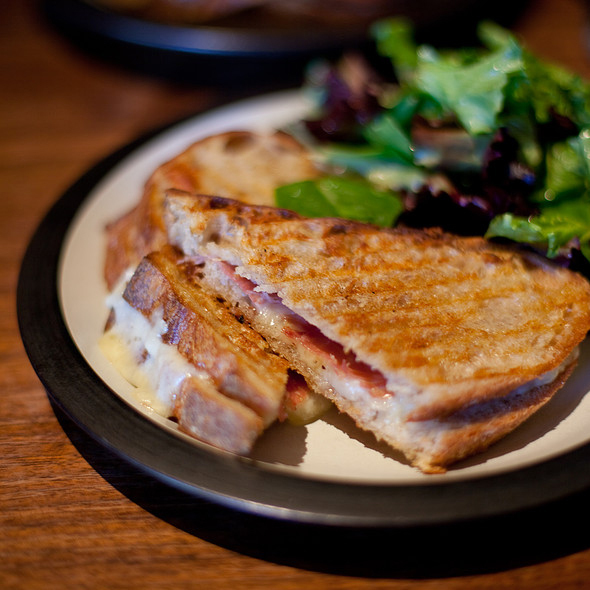 A panini press coaxes the very best from the quality ingredients – think Josey Baker's levain, San Joaquin Gold (a cheddar-like cheese), chevre, La Quercia prosciutto, and Dalmatia fig preserves – and the resulting sandwich is crispy, gooey, savory, sweet, and completely irresistible. Before you know it, you’ll be ordering another. While locals already flock to this restaurant from beloved chef Chris Cosentino for his meaty offerings (like the oven-roasted pig’s head and behemoth pin bone steak), sandwich aficionados should no longer overlook his elegant take on grilled cheese. More of a fork-and-knife situation, this version features soft taleggio cheese between slices of buttery, griddled brioche. While some might be satisfied with stopping there, Cosentino takes it over the top by capping the sandwich with a golden fried duck egg and a drizzle of buckwheat honey. Believe it or not, this popular sports bar in the Castro turns out one of the city’s finest chicken sandwiches. The meat is aggressively seasoned – you can actually see flecks of herbs in the thick, golden crust – and the spicy slaw is made with colorful red cabbage and carrots. The toasted brioche is soft and subtly sweet, so every mouthful elicits moans and eye rolls. As if all this goodness wasn’t enough, you also get fries or salad on the side. Score. There’s no shortage of quality banh mi in San Francisco, but to find one that’s this humbly-priced and well-executed feels like an added bonus. The special combo is the best seller here and for good reason: The bread is airy and crisp, the meat fillings (roast pork, paté, and head cheese) are substantial without being too heavy, and the accouterments (mayo, pickles, and cilantro) are straightforward. It’s a wonder that this sandwich still costs under $4. Even though this family-owned Marina institution opened in 1929, its sandwich game is still going strong. As for what to get, try the #1 Italian Combo. It’s a classic Italian hoagie that’s been tweaked just enough (but not too much) to place it in a league of its own. Fresh-sliced salami, ham, and mortadella are a given, but the clutch of bright greens and tangy Italian pepper relish lighten up what could be just another Italian sandwich. Asian-inspired sandwiches are the specialty of the house at this casual spot in the Mission. For the best-selling chicken chicken katsu, a crunchy, panko-crusted chicken cutlet is surrounded by creamy slaw and pickled red onions, then tucked between Acme ciabatta. But if you’re not in a meaty mood, fear not: The mock meat sandwiches, like the veggie Korean steak, are also surprisingly hearty and filling. Owner and Cleveland native Adam Mesnick is renowned for creating sandwiches that are belly-busting, but still pretty. “I believe the deli can be a delicacy, an art,” says Mesnick. And despite the hefty price tags at his SoMa shop – a sandwich can run you $16– the lines are consistently long. A terrific example of Mesnick’s original sandwich art the “Kuip,” a French roll loaded with pastrami, corned beef, salami, American cheese, slaw, cherry peppers, mayo, and thousand island dressing. It’s a beast, a beautiful, delicious beast. An oldie but a goodie, this classic deli has been open since 1896. After selecting your bread from the plastic bin – always go with the Dutch crunch if it’s available – hand it over to a guy behind the counter and order the Molinari Special. An intensely meaty sandwich, it’s comprised of a random assortment of Italian cold cuts, ranging from salami to coppa. A generous squirt of yellow mustard and fistful of peperoncini lend balance and cut through the rich, fatty meat.